Capt. David Boshell and first officer Melissa Van Dyke emerged Friday morning from an Alaska Air Cargo plane carrying a 48-pound king salmon. 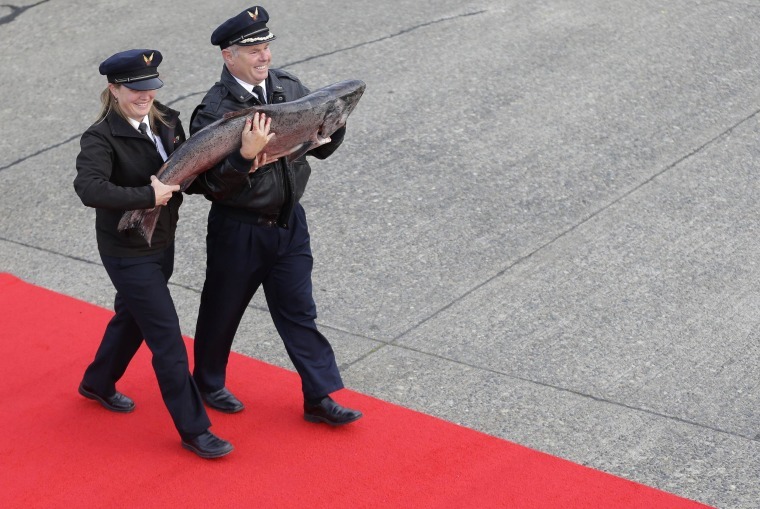 They carried it down a red carpet and delivered it to three chefs for a ceremonial cook-off at Sea-Tac Airport near Seattle. The plane carried 27,500 pounds of salmon that were caught Thursday when the commercial gillnet season opened in Prince William Sound. This is the first shipment of the prized salmon this year headed for restaurants and grocery stores, and the event is celebrated by Alaska Airlines as a rite of spring. The Alaska Department of Fish and Game estimates the seasonal harvest at 1.6 million Copper River sockeyes, 22,000 kings and 280,000 pinks.